Friends..we are receiving many queries regarding the Job profile of Postal/Sorting Assistant. 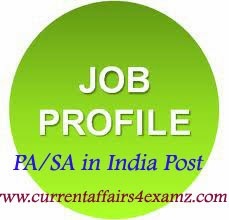 As this time in PA/SA Exam 2014 Application, one can apply for all Posts in order of preference it is important to know the difference between each post before applying( For notification: Click Here). We hope the following post will help you. 1) PAPO- Postal Assistant in Post Offices: Once you get into the job you will be posted in Post Offices and had to work in counter. All of you might have visited Post offices atleast once to send a Speed or Registered article no? The person who sits in the counter and helps you in booking the article is one such a Postal Assistant. The benefit of PAPO is that you can regularly come across many customers and will always be updated with the latest changes happening in the Post Office environment. 2) PASBCO- Postal Assistant in Savings Bank Control Organization: As the name suggest the work will be related to monitoring the Savings Bank related works. Unlike PAPO, PASBCO cannot work in all Post Offices. The posting will only be in Head Post Offices working in the Circle. One thing to note is that the present working procedure of PASBCO is going to change drastically in the coming days. As the Post offices are getting migrated to Core Banking Platform the nature of working will also change in the days to come. 3) PACO/RO- Postal Assistant in Circle/Regional Offices: Circle/Regional Offices are the administrative wing of Postal Department. PA CO/RO is a separate administrative cadre and those selected are posted at Circle/Regional Offices situated in main cities within the circle (max. 2-5 offices). The benefit of PA CO/RO is that as it is an administrative office, working days will only be 05 (Monday to Friday). But the working hours is more in a day 9PM to 5.30PM. The nature of working is also different in this cadre. The nature of work will be mainly File work and PAs will not be dealing directly with the customers. 4) PARLO: Postal Assistant in Returned Letter offices. Mail not delivered for want of address, is re-directed to the sender if that address is there on the article. Otherwise, it is sent to the Returned Letter Office. In the Returned Letter Office, efforts are made to locate the correct address of the addressee, and if located, mail is forwarded to the addressee. When the address of the addressee cannot be located, efforts are made to locate the address of the sender by opening the letter. If located, mail is returned to sender. Mail which cannot be delivered either to the addressee or to the sender is disposed of, after detention for the prescribed period. So the working will be related to this. 5) PAMMS: Postal Assistant in Mail Motor Services. It plays an important role in intra-city transmission of mail between mail offices and Post Offices. 6) PAFPO: Postal Assistant in Foreign Post Organization. Deals with the foreign articles transmitted through Post office network. 7) SARMS: Sorting Assistant in Railway Mail Service: Work is related to sorting of mails being sent through the Post Office Network. An article booked through Post office will reach the RMS. At RMS the SA will sort the mail according to pincode or address. A SA will not be posted in Post Offices instead they will be posted in RMS Units available within the circle mainly situated in a Railway Station or near it. The benefit of SA is that duty will be in shifts and often had to work in night shifts also. But once you take a night shift the next day you will be free.